For over 40 years I have been touring the world and performing… sometimes for thousands of people in grand public arenas, and sometimes just for a private audience. In hospitals, we are even two clowns for a single patient. And once we even swarmed a geriatic care center with 90 clowns at once! What a mega-dose of humor for a very special group of aged people. That was a real event. What’s special about the work in hospitals and therapeutic venues is the ongoing creativity, the development and nurturing of relationships as an artist in residency, and also the intimacy and the connectedness you experience with your colleagues as well as the ones you clown for. Two clowns, improvising for hours on end, playing as if this critical little world of nursing-care were just a sand-box full of toys and opportunities, inspiring a celebration of all the themes that make life worth living. Here you interact quite closely with single individuals and sometimes also little groups. Here you deal with all the issues of broken health and faltering dreams. Here you are bringing joy and lightness to people in need of care — and yes… also FUN. And when you finish a day of this kind of work, you go home filled with purpose and satisfaction. It is like a shower for the soul. 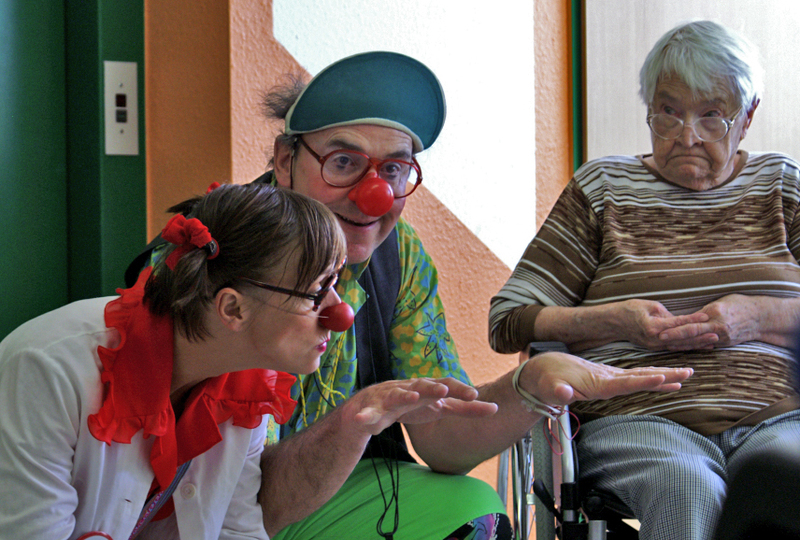 In 1978 Willi’s first “outreach visits” to special care institutions began while on-the-road up and down the Pacific Northwest with colleagues from Kit-n-Kaboodle Clown Theater. The idea was to go to those who couldn’t come to them. The response was an overwhelming kind of gratitude that inspires a conviction to want to go on serving in response to need. Eventually this led to an ongoing programm in a psychiatric ward in Eureka, California, where Willi soon discovered the tremendous power of the Clown, especially for people with severe mental and psychic disorders. After moving to Europe in 1983, Willi’s Hospital Clowning got put on hold until meeting two brothers at a clown-workshop in 1994. Kalli and Sven had the plan to start a clown programme for a children’s cancer ward in Berlin-Buch, and Willi went on-board with them. 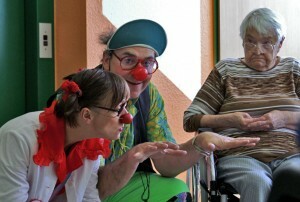 Thus was born the Klinikclown movement centered in North-Eastern Germany. Nearly 20 years later… we are still performing in hospitals, geriatric and psychiatric wards, in rehab-centers and numerous other care institutions where broken souls get space and time to heal. Of the 30-some programs that we have initiated, ALL are still receiving Clown-Visits. That is a remarkable testimonial to the validity and need of this work. In this blog I want to share with you some of the stories of our visits. The names have been changed to protect the innocent. But the messages are real… as real as Life and Death.